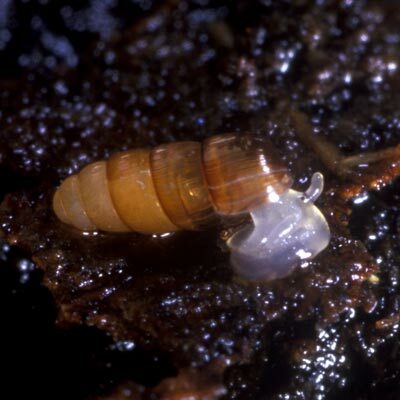 A tiny species with glossy cylindrical shell and an operculum living in deep, stable leaf litter, moss or soil in wooded habitats on base-rich soils. Distribution centred upon the British Isles but known also from Belgium, north-west Germany and France south to the Basses Pyrénées. Commonest in the west, including Ireland. Distribution type: Oceanic Temperate (71). Widespread, sometimes common, in old woods or scrub in limestone areas eg. central limestone plain. Local and rare elsewhwere. Anderson, R., (2016). Acicula fusca (Montagu 1803). [In] MolluscIreland.